class="page-template-default page page-id-91933 group-blog masthead-fixed full-width singular wpb-js-composer js-comp-ver-5.7 vc_responsive"
The Nebraska Delegation only had one working day in Copengagen, since all business is closed on Sundays. Thanking a pre-exhisting company within Nebraska, was the main reason to visit. “Here in Denmark we had the chance to sit down with a company who has already invested a quarter of a billion dollars in Nebraska – Novozymes,” said Governor Pete Ricketts. 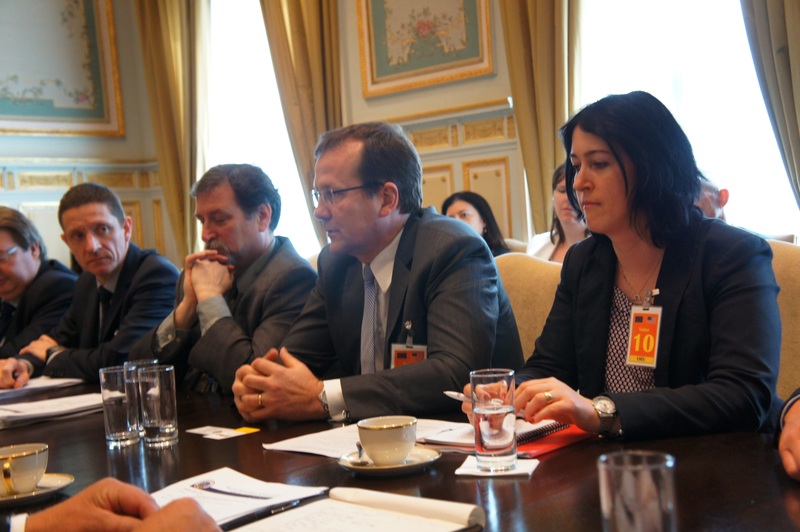 Before heading to Novozymes, the delegation had a briefing at the Embassy of the United States. This was to allow delegation members have a better understanding of the current situations in Denmark. Novozymes hosted a biosciences ’round- table’ to some of the Nebraska delegates. This aloud both parties to talk about topics under biosciences that were important to them. Courtesy of Matt Miltenberger. 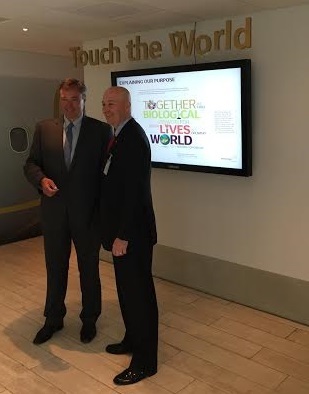 Governor Pete Ricketts meets with Novozymes CEO Peder Holk Nielsen. “We talked a lot about ethanol and renewables. We also talked about other chemical opportunities, enzymes and so forth, and so how, again, we can take advantage of the agriculture economy but then really focus on the value added and what that means for Nebraska,” said Director of Economic Development, Brenda Hicks-Sorensen. The entire delegation was then able to attend a tour of their facilities. “We were glad and honored that you guys took the long trip to Denmark and other places in Europe,” said Anders Kristoffersen, Public Affairs Manager with Novozymes. RRN’s Jesse Harding. 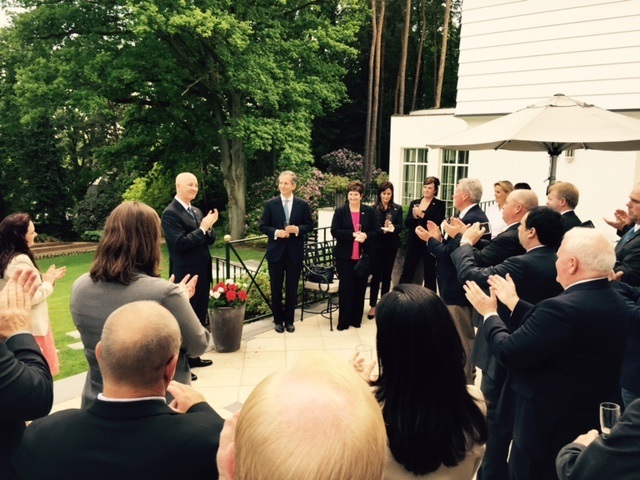 Governor Pete Ricketts talks to the delegation and guests at U.S. Ambassador’s residence. Hor’durves were served at U.S. Ambassador Gifford’s residence. RRN’s Jesse Harding. Governor Pete Ricketts along with U.S. 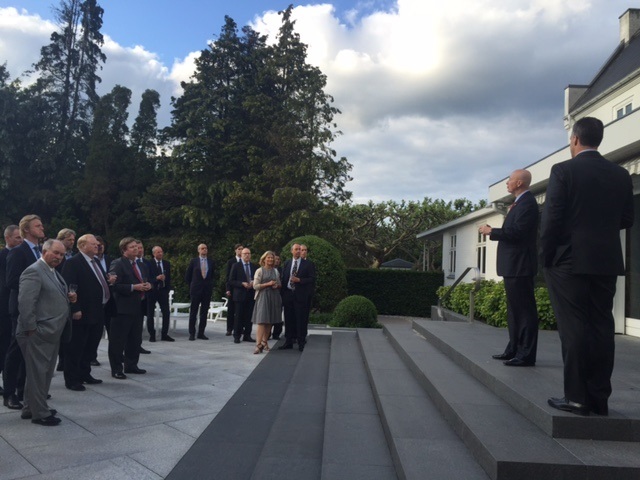 Ambassador Gifford talk to the delegation and guests at the Ambassador’s residence. “I am really grateful for everybody who came along on the trip. The folks who came as apart of the trade delegation again, we had producers from all across the state, we had people from people from the biosciences industry and renewable fuels industry. They all payed their own way, they all volunteered their time, took time out of their busy schedules, away from their families, and they did a wonderful job representing Nebraska. 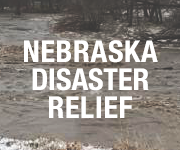 And I’m just very grateful for their participation,” said Governor Pete Ricketts. Duane Kristensen, Operations GM, Chief Ethanol Fuels Inc.
Paul and Deb Gangwish, PG Farms, Inc.
Dan Jensen, VP Sales and Marketing, Greater Omaha Packing Co.
Bret Wyant, VP Sales, American Laboratories Inc. The final working day in Brussels, on the Governor’s first international trade mission, was nothing short of a busy one. The Governor’s morning started with a meeting with the Commissioner of Agriculture, Phil Hogan. A small group of delegate participants were able to attend. “We found that many of the upper level European Officials really understand bio technology way better than the general public does,” said Director of Agriculture, Greg Ibach. RRN’s Jesse Harding. Director Greg Ibach presents about Nebraska Agriculture. Another small group met up with the Governor to attend a Bioscience meeting with some companies such as; Archer Daniel Midland (ADM), Bayer Crop Sciences, Novozymes and others. It was really to showcase what Nebraska has to offer companies like this in means of facilities, products and green technologies. Courtesy of Stan Garbacz. 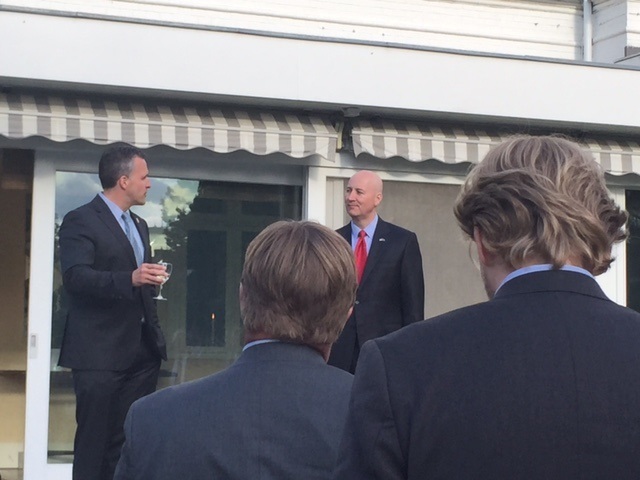 Governor Ricketts and Ambassador Gardner both speak the dinner hosted at the Ambassador’s residence. Dinner was hosted by U.S. Ambassador to the European Union (EU) Anthony L. Gardner, at his personal residence. 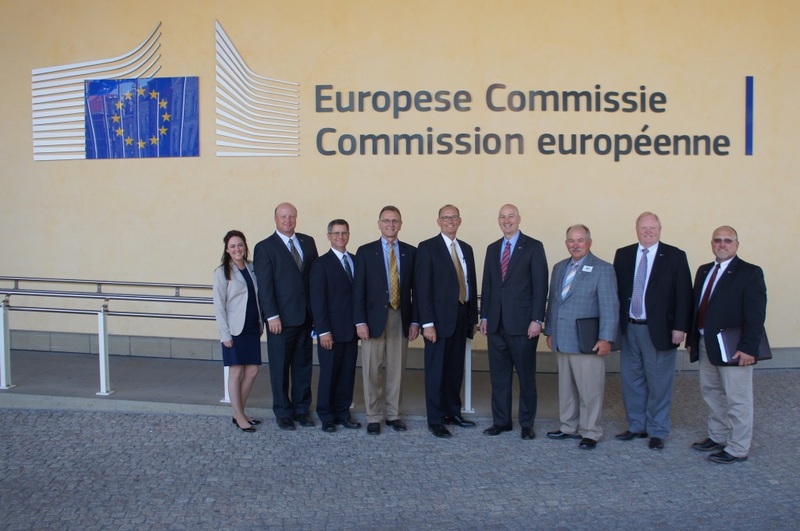 Some EU officials and USDA FSA members attended and continued trade conversations. In the next month, the Ambassador will be hosting a beef event to showcase U.S. products to the European Union. He says most attendees will be EU Officials and Companies. “We are trying to break down a lot of characters, misconceptions about American agricultural exports and we are trying to make clear that American products are competitive and Europeans should want to buy them,” said Ambassador Gardner. Courtesy of Stan Garbacz. Dinner hosted at Ambassador Gardner’s residence. This concluded the portion of the trip that was hosted by the Nebraska Department of Agriculture. The main goal in visiting Brussels is meeting with European Union (EU) Officials to discuss trade relations. Kicking off the first morning, was with the USDA in their U.S. Mission to Europe (USEU) with the Foreign Agriculture Services (FSA). They were able to give a briefing, along with other USDA segments, about the background on the EU and where their agricultural viewpoints stand. RRN’s Jesse Harding. Jim Higgiston, Minister Counselor of Agriculture with the USEU and USDA FSA briefing the delegation on the EU. The first EU group the delegation met with was Copa Cogeca, a European Farm Cooperatives and Farmers’ Association. The major topics we discussed was Genetically Modified (GM) crops, antibiotics in meat production and geographical indicators. Just like in the United States, their producers don’t always agree with what the government has proposed – a prime example of this was the recent proposed rule that member states could make their own decision to allow or accepts GM crops. RRN’s Jesse Harding. In the meeting with Copa Cogeca. (L-R) Paolo Gouveia, Director of General Affairs; Arnaud Petit, Director of Commodities and Trade; Jim Higgiston, Minister Counselor of Agriculture with the USEU and USDA FSA; Pekka Pesonen, Secretary General; and Camelia Gyorffy, Senior Policy Adviser for Livestock. “Treating farmers differently, in different member states, depending which government is favorable or less favorable to GMO’s – is simply unfair and we don’t like it. And it would also damage our inputs especially, to meat production like pig meat and poultry sectors. When it comes to the U.S., we are dependent on U.S. imports of soybeans. Therefore, we have major fears if this would work and it would endanger the very principals of the EU. And that’s why we are against it,” said Pekka Pesonen, Secretary General of Copa Cogeca. 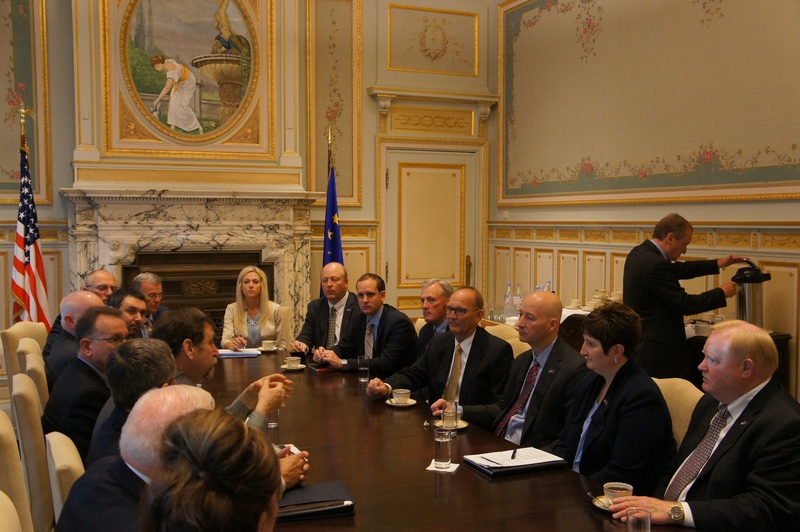 A small group accompanied Governor Ricketts to the European Commission. 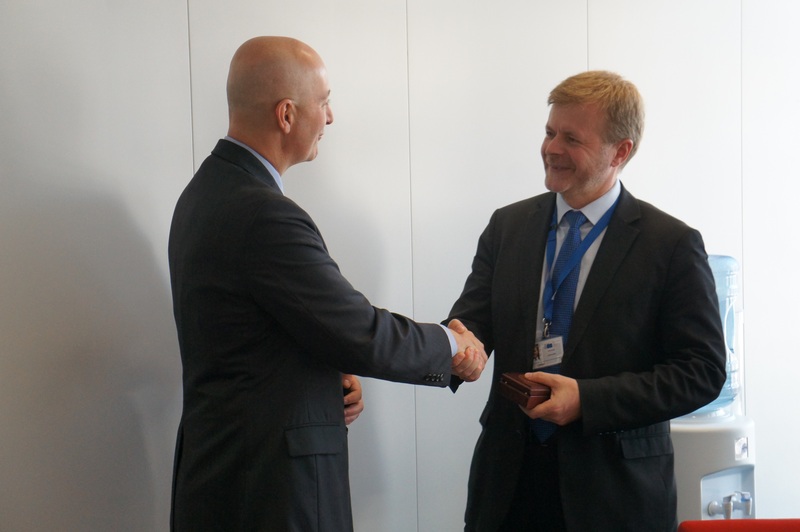 A small group traveled with Governor Ricketts to a meeting at the European Commission, where they talked to Arūnas Vinčiūnas the Head of Cabinet with Health and Food Safety. While others met with Marc Zoltan Somogyi, Head of Unit for Agriculture, Fisheries, Sanitary and Phytosanitary Market Access and Biotechnology, DG Trade, and the majority of the group toured the European Parliament. RRN’s Jesse Harding. Governor Ricketts thanks Arūnas Vinčiūnas, Head of Cabinet with Health and Food Safety, for taking time to talk to the Nebraska Delegation. Similar again to the United States, public perception is driving some member states to consider banning GM crops into their country. “It is really a bit of public perception of negativeness and (it’s) very easy to scare people with some negative miss-information. You know, you can run around with a Frankenstein maize and then every one will sign a paper (saying) ‘I don’t want that!’ Sure but, there is no such thing. Scientists here and our food safety authority are really the best scientists we have and when they say there is no health risk, then there is no health risk,” said Arūnas Vinčiūnas, Head of Cabinet for Health and Food Safety. 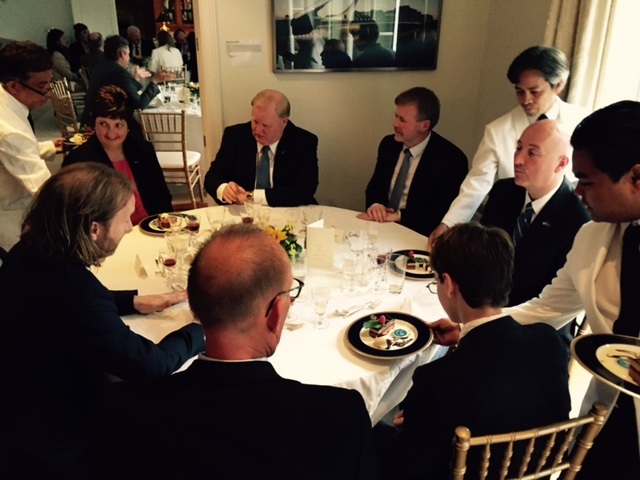 Dinner was hosted at the USEU by Ambassador Anthony L. Gardner. RRN’s Jesse Harding. Governor Pete Ricketts thanks Ambassador Anthony Gardner for hosting dinner. 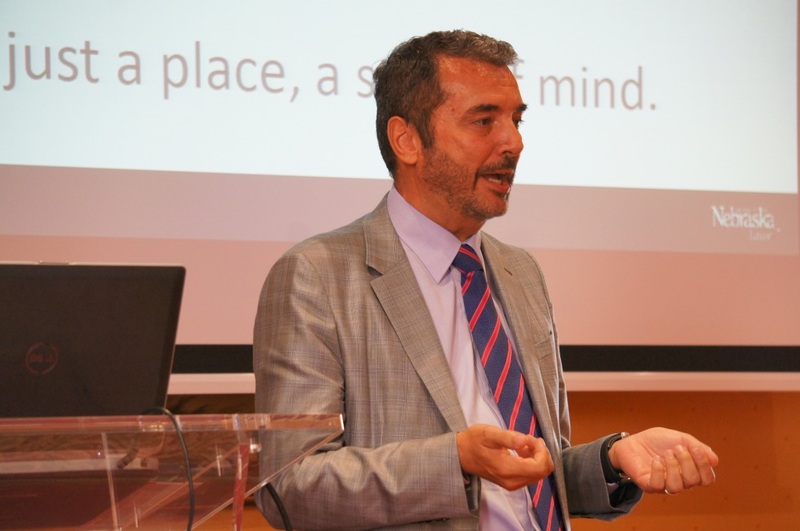 The final day in Italy was spent hosting a “round table” discussion to Italian Companies. The Goal was to promote Nebraska as place where companies can open up American sectors. 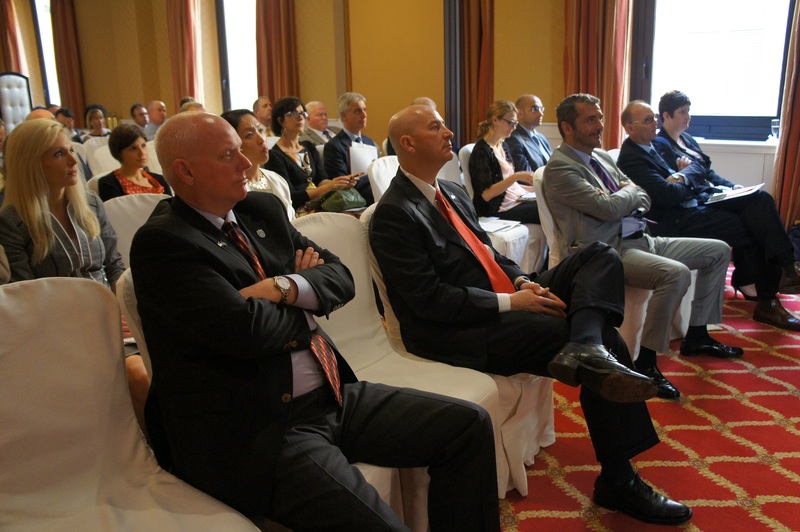 People who presented to the Italian Companies were: Governor Pete Ricketts, Director Ibach, Director Hicks-Sorensen, Dan Duncan, Rolando Flores, Marco Checchi and Suji Park. RRN’s Jesse Harding. Marco Checchi, CEO and owner of Pelliconi, presenting during the promotional event. Marco Checchi, CEO and owner of Pelliconi, as a division of his business in the United States – but not in Nebraska. He provided testimonial on the benefits of what America has to offer. “It was amazing to seeing these people from Nebraska from so far away coming to Bologna and experience this city, visiting this city and understanding the differences in culture but mainly the similarity we have,” Said Checchi in Italian and English. RRN’s Jesse Harding. Participants of the Investment Promotion Event listening to a speaker. Director Hicks-Sorensen thought the overall event went well and was well received. 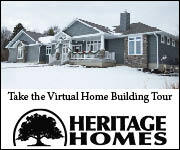 “The feedback was absolutely positive. One of the attendees from Italy actually very enthusiastically highlighted that she didn’t have a passport and was going to go fill out the paperwork that afternoon. And she was looking-forward to coming to Nebraska,” said Director Hicks-Sorensen. After the event, the entire Nebraska Delegation and some of the Italian Companies who attend the meeting went to a lunch where Nebraska beef was served. 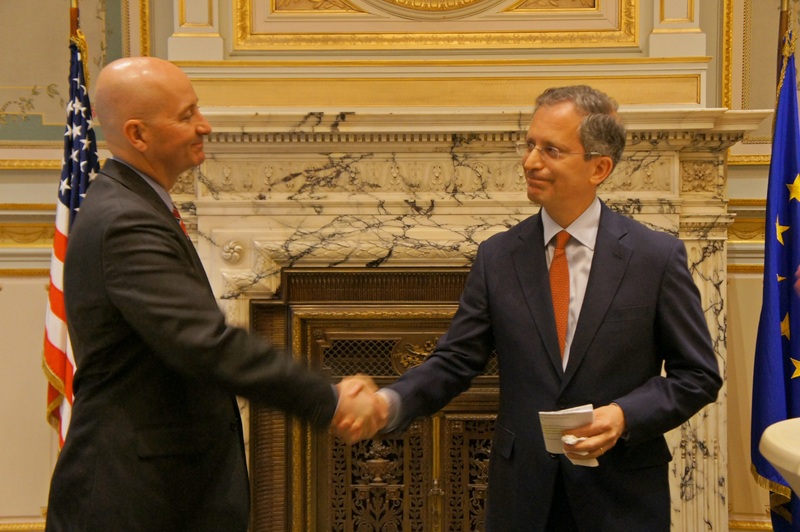 Following lunch, Governor Pete Ricketts presented the Italian participants, with the help of Director Ibach, an Honorary Nebraskan Citizenship. RRN’s Jesse Harding. 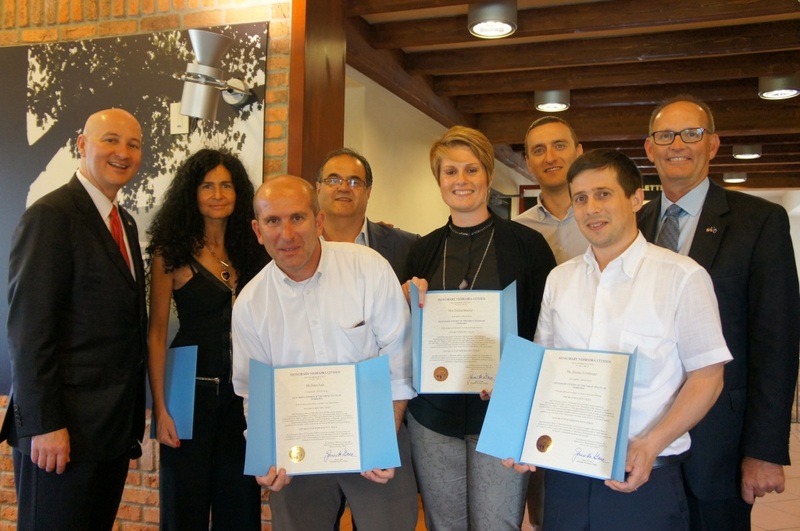 Governor Ricketts with Director Ibach with the Italians after receiving Honorary Nebraskan Citizenship. 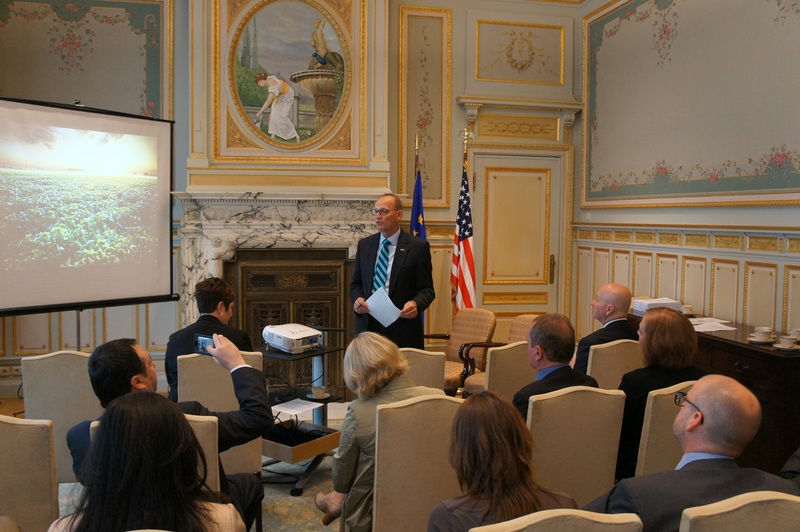 After the lunch, the Nebraskan Delegation headed to the airport flew to Brussels, Belgium. For day two the group split up between locations. 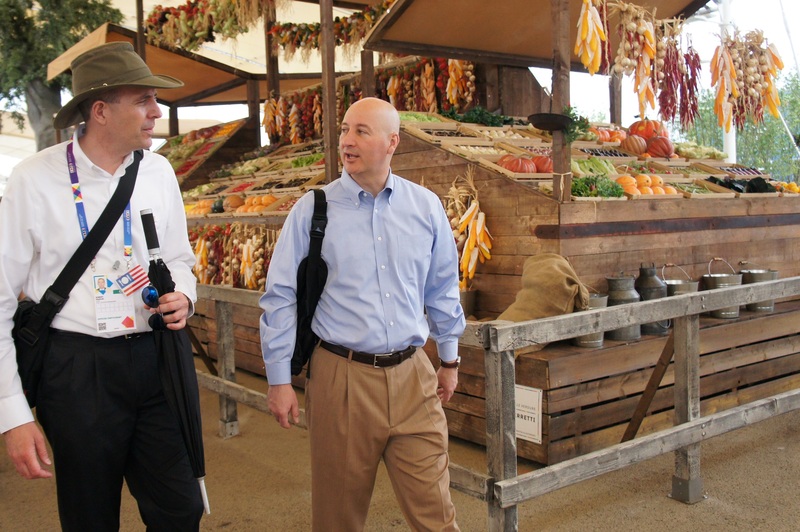 Most of the group went with Governor Pete Ricketts; Director of Agriculture, Greg Ibach; and Director of Economic Development, Brenda Hicks-Sorensen, to the World Food Expo in Milan. While other participants went on a tour of a feed lot and meat product processing facility. A train was taken to Milan to visit the Expo. The Expo is held every four years in different countries each time. Different countries and companies build large pavilions to show case their food products. RRN’s Jesse Harding. PCO Robert Peaslee joined the group to show them around the expo. He talks with Governor Ricketts about his job duties. Coldiretti hosted the Nebraska group for lunch. They are a farm organization (similar to Farm Bureau or the Farmer’s Union but, are more like a co-operative) that help support their producer members. When greeted, they had musicians play the American National Anthem. The purpose behind meeting with Coldiretti was, “That’s a possible distribution channel for our Nebraska products in the future. 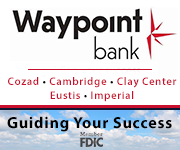 So, that’s the reason why we wanted to develop the relationship with them,” Said Governor Ricketts. This was a great opportunity for all the participants, to get a better feel for the countries traditions and products. Even though it is a business trip, apart of that means to better understand the culture and traditions to build strong relationships. RRN’s Jesse Harding. 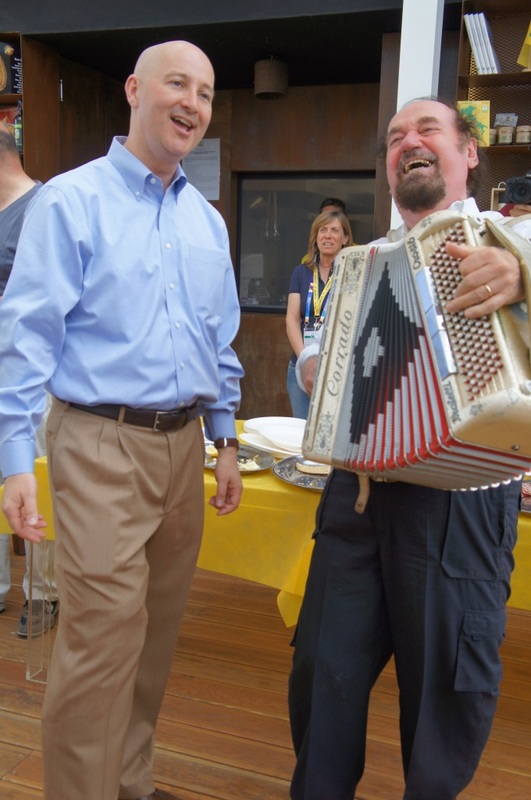 Governor Ricketts partakes in a tradition of singing with an accordionist. Coldretti showcased some of their member’s local – traditional products such as, balsamic, parmigino-reggiano, salami and prosciutto. RRN’s Jesse Harding. 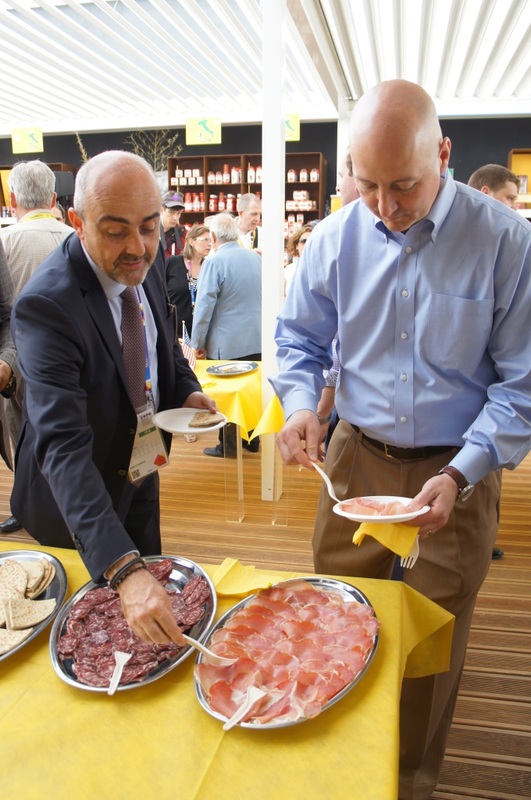 Governor Ricketts samples traditional products of aged salami and prosciutto with Coldretti member. To make parmigino-reggiano, the milk has to come from registered Red (Reggiano) cows and be aged for a minimum of 24 months. They they go through a rigorous process to be stamped as traditional parmigino-reggiano cheese. For the balsamic comes from to regional specific grapes and is aged for 12 to 25 years. Third generation producer says that it is hard for young people to start producing traditional products since there is the aging and becomes a family tradition to keep operations going. RRN’s Jesse Harding. 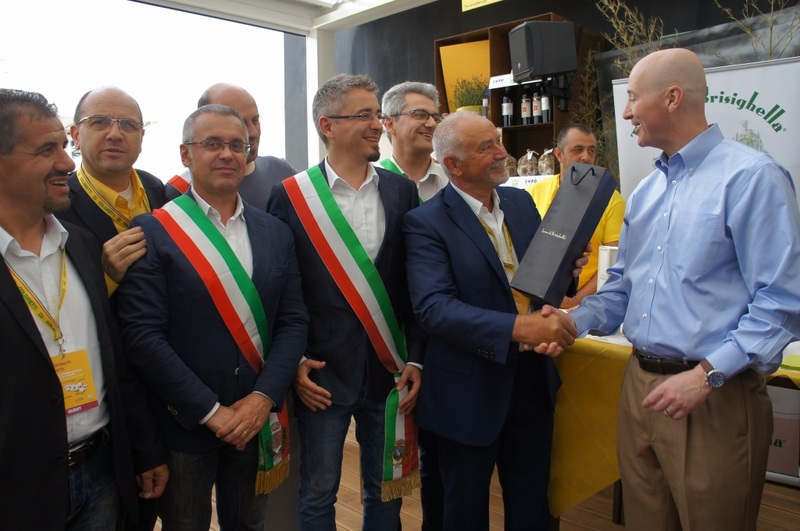 Governor Ricketts presented with some traditional Italian products by the Coldretti. RRN’s Jesse Harding. The group with PCO Robert Peaslee and Carlo Lambro, President of New Holland Agricultural in front of their pavilion. 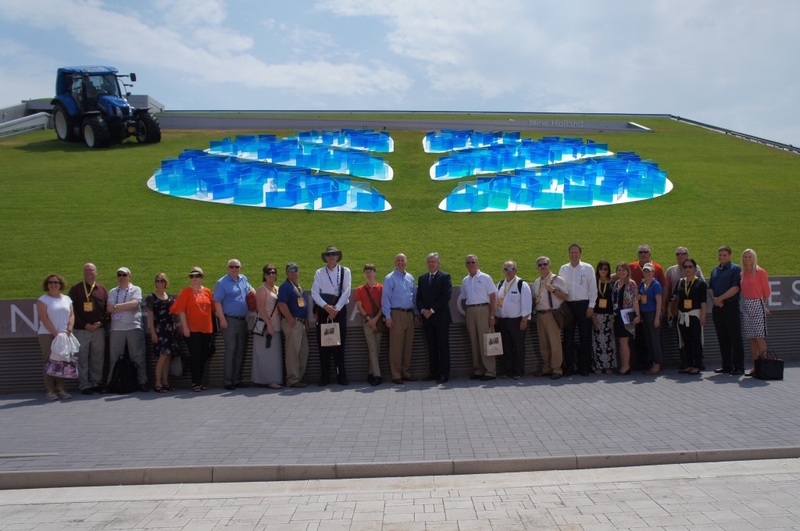 After lunch with Coldretti, the group went through the USA Pavilion and then the New Holland Pavilion. The Governor was able to learn more about the company and the different types of equipment they produce. RRN’s Jesse Harding. 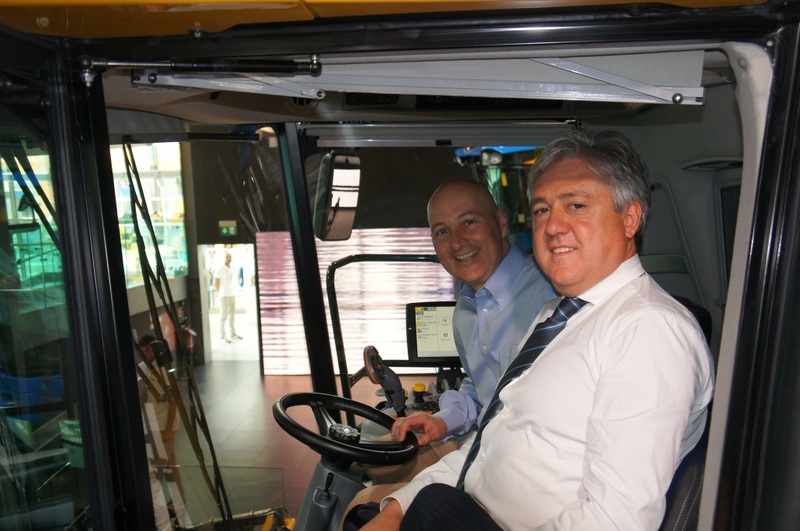 Governor Ricketts with Carlo Lambro, President of New Holland Agricultural in the cab of a tractor. The group who did not go to Milan, went and toured the Busseto Plant (a meat product facility) and a feed lot – both owned by Inalca. In the Busseto Plant they make processed meat products such as salami. Steve Nelson, President of Nebraska Farm Bureau, said he was really impressed how they were able to keep to their traditions and still have modern facilities. “The main difference was all of the cattle were in doors or at least covered by roofs. Confined feeding as we would know it in the U.S.,” explained Nelson about the biggest difference compared to Nebraska feed lots. He also says most of the cattle were Charolais or Limousin, which typically comes from France. Courtesy of Steve Nelson, President of the Nebraska Farm Bureau, of the facilities of the Inalca feed lot. “It’s noteworthy to say that this company purchases a good amount of beef as well. Still a demand for the high quality products that we raise in Nebraska, that are feed in Nebraska with Nebraska corn – that provides a level of quality that are hard to find else where in the world. And so, I know some people at home and in Nebraska are concerned about the size of operations and this is a huge operation that we have been visiting and visiting different parts of their facilities. At the same time, it’s an opportunity to bring Nebraska products into apart of the world that Nebraska products would be otherwise. And there is demand for Nebraska products and I think it’s very important to continue to build these relationships to enhance the value of what we do in Nebraska,” said Nelson. We arrived into Bologna around 11am on Monday, June 8, and was able to check into the hotel. Director of Agriculture, Greg Ibach showed Department of Economic Development and myself around the area before we took off for our first tour. We took a bus to the Inacla beef processing facility. Inacla is a large facility (for the country) that will process around 5,000 head of cattle per week. The Inacla group has several facilities throughout the county. This allows the group to process about 70 percent of the cattle in Italy. They also are the largest importer of Nebraska beef in Europe. In the facility we toured, not only do they break down the cattle, they also do packaging. 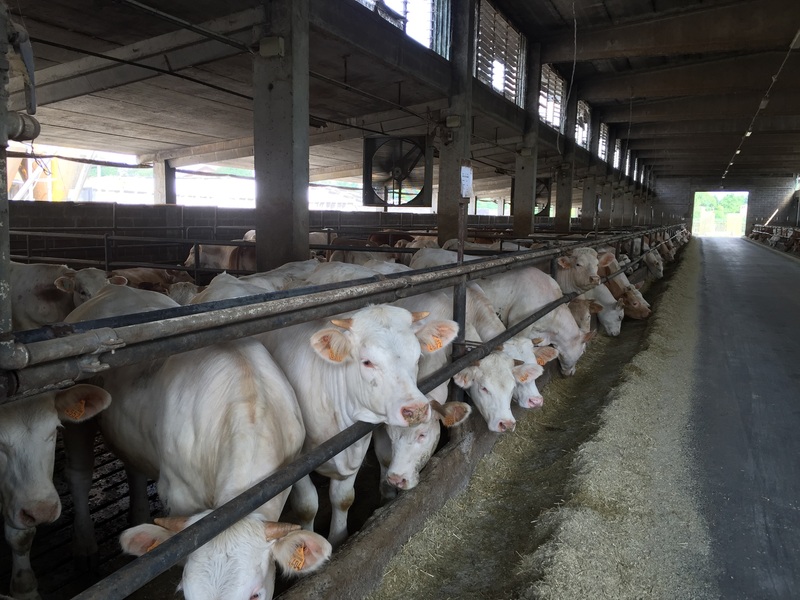 “Inacla groups go through about 10,000 cattle every week. This is the bigger quantities that we use because only 10 percent comes from outside,” said Salieri Francesco, Quality Control Manager with the Fresh Department of Inalca Packing Facility. 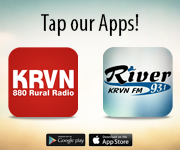 RRN’s Jesse Harding. 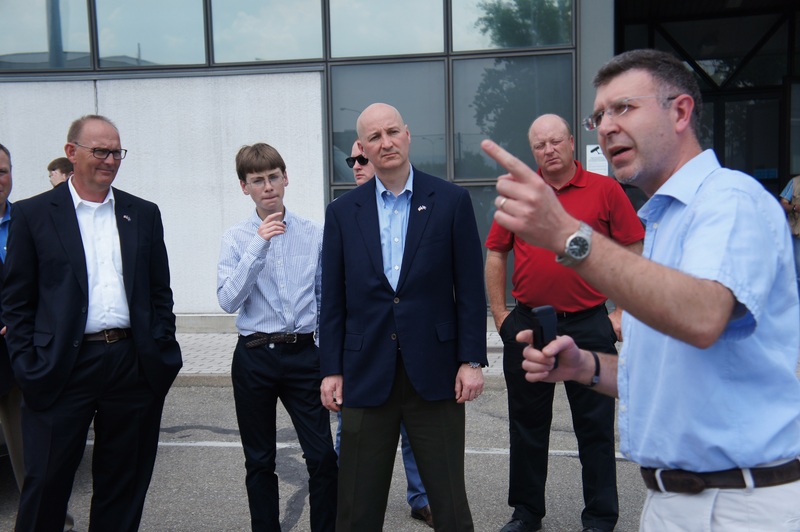 Salieri Francesco, Quality Control Manager with the Fresh Department of Inalca Packing Facility (right) explains the operations to the Director of Agriculture, Greg Ibach (left), and Governor Ricketts (center). The two main differences between the two countries was the types of cattle and management of the cattle and the labeling/transparency of the cattle. They have a large veil industry and require them to be between under eight months of age. In Italy they also don’t castrate their cattle so, a large majority of cattle processed are bulls. In Europe they have strict transparency laws. They require cattle to be tagged and id throughout their entire life. Cattle will have a passport and producers are required to have this when transferring the cattle. In the packing facility, they use a bar code system to track all the cuts of meat from all the individual cattle. The end products can be tracked not only to the individual farms but to the cattle themselves. Labels will say were the cattle were born, raised, processed. “What I think what is most important about trade missions and opportunities to work with customers is learning about them and building a relationship. So, today they were able to show us what they were proud of, which is plant and their process, and at the same time we had the opportunity to understand how they market so we then can work our Nebraska beef into their marketing and company goals and plans too ,” said Nebraska Director of Agriculture, Greg Ibach.